Samsung Electronics Co. said Thursday it will use the New Bixby artificial intelligence platform in devices released before its Galaxy Note 9 flagship smartphone and invite more users to use the latest system. The South Korean tech giant, which launched New Bixby in August alongside its latest high-end smartphone, the Galaxy Note 9, said the application will be provided to users with older devices, including the Galaxy S8 and Galaxy Note 8, by the end of the month. The update will be intstalled when a phone updates to the Android 9.0 operating system. The latest move is in line with Samsung's efforts to beef up the number of Bixby users. The company recently launched test runs of New Bixby in German, French, British English, Italian and Spanish. Samsung said it plans to expand the system's ecosystem by opening up the software developers' kit and inducing more developers to release "capsules," a term the company uses to describe services available on New Bixby. The tech giant plans to kick off its Bixby Marketplace next year. 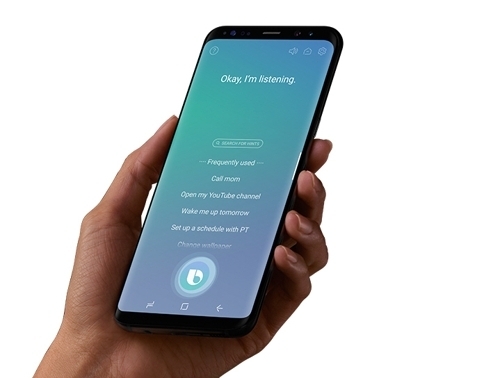 Local users of New Bixby, however, have been expressing complaints that the latest version is unable to carry out as many tasks as the earlier edition. For example, New Bixby currently does not connect to KakaoTalk, the most popular mobile messenger in South Korea, in contrast to the original Bixby.